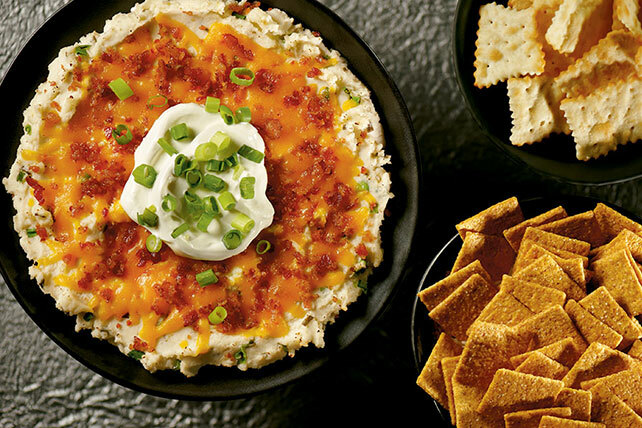 Enjoy the deliciousness of a loaded baked potato with this 'Baked Potato' Dip. As a time saver, this 'Baked Potato' Dip uses instant flakes. Spoon into 9-inch pie plate; sprinkle with shredded cheese and bacon bits. Bake 15 to 20 min. or until shredded cheese is melted and dip is heated through. Sprinkle with remaining onions. Serve with chips. Prepare using 4 oz. (1/2 of 8-oz. pkg.) PHILADELPHIA Neufchatel Cheese, softened. Serve with multi-grain toasted chips or thin wheat snack crackers instead of the RITZ Toasted Chips. Prepare as directed, substituting prepared mashed potatoes for the potato flakes and reducing the milk to 2 Tbsp. Makes 2-3/4 cups or 22 servings, 2 Tbsp. dip and 16 chips each.